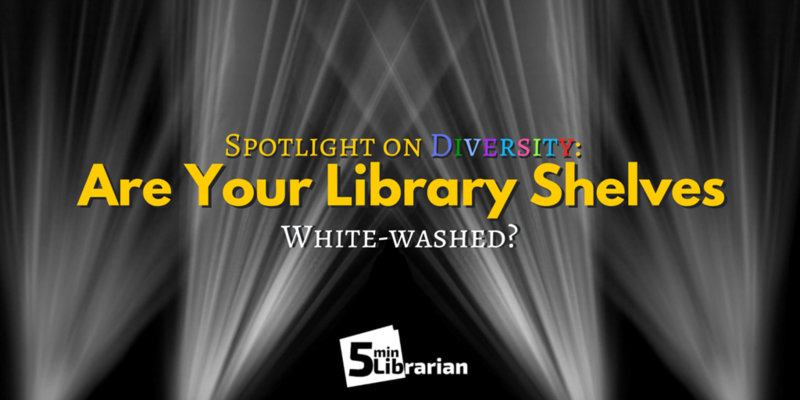 5 Minute Librarian: Spotlight on Diversity: Are Your Library Shelves White-Washed? 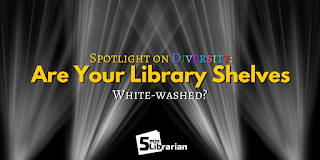 Spotlight on Diversity: Are Your Library Shelves White-Washed? As librarians, we strive to build a balanced collection that circulates, from a good mix of different genres to coverage of the big topics. This may lead to problems, though, if you are not paying a close enough attention to diversity. The Cooperative Children's Book Center just published results to their survey about diversity in the publishing world. The results are eye opening. 1. Where are you buying your books? According to the survey, the publishing world is primarily consisted of straight White Caucasians. That means the editors who are selecting the books, the advertisers who are selling them, the writers who are writing them-- every step of the process is dominated by this one segment of our population. And as such, there is little wonder why we don't have diversity in our literature. Up until recently, this was just accepted. Main characters are just white. If they were people of color, their images on covers were white-washed so the books would "sell". People are trying to make changes and bring this issue to the forefront, but it is very evident that it needs to happen on all levels. Public libraries - any library - is not immune to this, either. Unfortunately, nothing ever happens fast. In fact, over the past 20 years, despite diversity growing in our population here in the US, diverse books have remained at 10% of all books published each year. 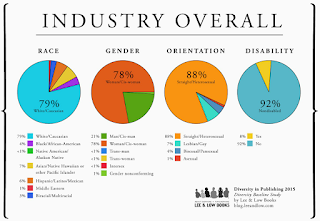 It looks even worse when you divide up that 10% to show the individual categories that fall into diversity: LGBTQIA, people of color, gender diversity, people with disabilities, and ethnic, cultural, and religious minorities (as defined by http://weneeddiversebooks.org). That's beyond pitiful. 2. Where are you getting your reviews? Do your reviewers read diverse books? Focusing on only the big journals may not be your best source of information to find lots of new diverse books. 3. What books are you buying? Are you only ordering diverse books that get starred reviews? Publishers will never publish more diverse books if we're not buying them. Of course, we don't want to fill our shelves with mediocre books; however, if we are willing to buy mediocre stories from white authors, we should be willing to buy mediocre stories from diverse authors, too. It isn't fair to only hold diverse authors to a higher standard. 4. What books do you promote? What books do you have on your displays? Do you have book lists that make it easy for people to find diverse characters? Do you make sure diverse books are included in all of your lists? Stay tuned for Allie's Diverse Book Lists! 5. What books are you deleting? Since it is a lot of work to find diverse books to order, can you imagine being a patron trying to find them to read? If we're not promoting them, people may not even know about them. When you are weeding your shelves, pay attention to how many diverse books you're taking out. Are you deleting more than you are buying? 6. What books are you reading? We all understand the importance of diversity in literature. I don't have to list out to you why we need these books on our library shelves. However, I am embarrassed to admit that when I actually looked at my own reading history, nearly all of the books I have read were white-washed and written by white authors. I wasn't making an active effort to read these great diverse books, so I had fallen victim to the unconscious bias. I hate to say "victim" because I'm not the type to be a victim of any type if I can help it, but the problem was - is - that so many of us don't even realize it's happening. I thought I was doing well - I was reading award winners and top reviewed books - but my sources weren't strong in diversity and I was influenced by the book buzz. Now that I fully understand how deep our white-washed literature goes, I'm realizing that I need to be part of the change. I need to read more diversity, turning it from a buzz word to just a part of my every day reading life. We all need to, if we want to make any strides to a more inclusive literature. 1. How many books have you read which featured a diverse character? 2. How many many books have a person of color as the main character? 3. How many books were written by non-Caucasians? If your answers were not many, it might be time to #colormyshelf. Good points you have made. This is a problem our library has and I have a hard time fixing. It is s church library and my problem starts with the lack of diversity in the authors I can choose from. The only area with diversity is the bio-autobio area...there I have books by and about African-Americans, Hispanics and Native Americans, plus people of interest from a number of non-white non-European countries. Picture books are much harder, especially with so many Bible based books. I try to avoid buying new books that have blond light skinned Marys for example. But most of the illustrations tend to show European looking Biblical characters. Any author suggestions for me? We are not Catholic or Lutheran so we do not use those associated publishing houses. I mainly stick with Tyndale, Harvest House, Herald Press, Bethany, David C Cook, occasionally Bob Jones, Multnomah, Baker Book House, Intervarsity Press, Lighthouse Chr. Publisher, Moody, Thomas Nelson, Zondervan. I buy up used books at the public library books sales and the half priced store, mostly Scholastic type books. I have found some diversity this way in youth books, apparent in the illustrations. If you are worried about content, I would double check with https://www.commonsensemedia.org/ to see if they are clean reads. Unfortunately, there isn't a lot of diversity to choose from out there. I don't know your approved publishers and how they are in this area, but could you get approval to buy from Amazon, too? Especially if you are buying award winners? (ALA gives a few out for diverse authors) Our library has a business account with them, which makes things easier.